OLYMPIA, Wash. – The Oly Town Artesians indoor soccer team opens their third season in the Western Indoor Soccer League when they host the Olympic Force on Saturday, November 12th at The Pavilion at The Evergreen State College. It is the first game of a ten game WISL schedule that runs from mid-November to late February. 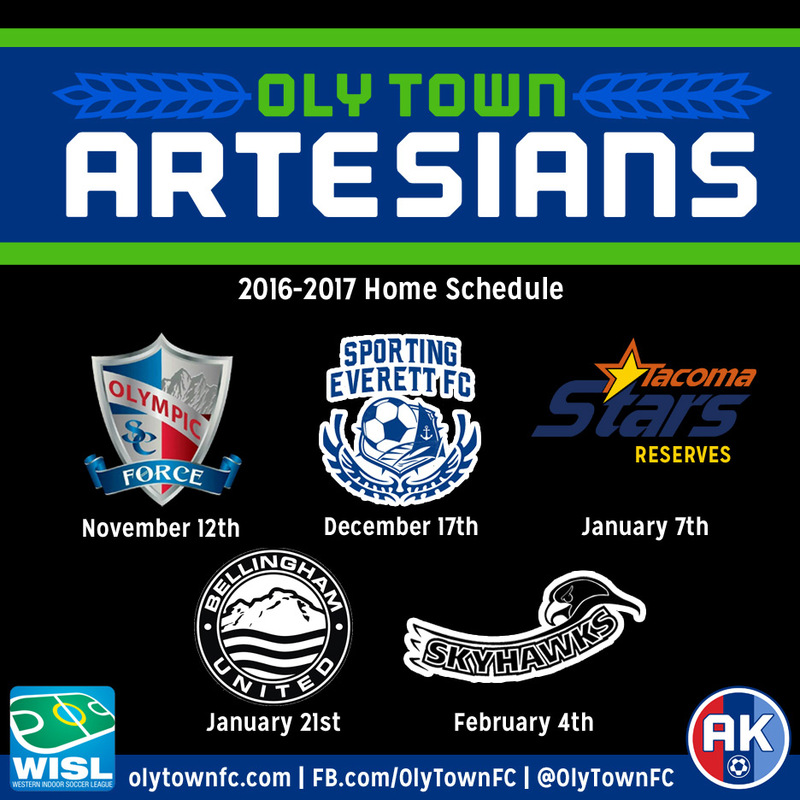 The Artesians will play five home games starting with the league opener on November 12th against Olympic, last season’s WISL runners-up. The team will honor Austin Kelley, our teammate that tragically passed away in September, at the home opener. More information on Austin Kelley Night will be released shortly. They then return to the pitch at The Pavilion on December 17th against Sporting Everett to round out the 2016 portion of the schedule. Following the holiday break, the Artesians host the Tacoma Stars Reserves on January 7th and league champs Bellingham United on January 21st before finishing their home schedule against the Snohomish Skyhawks on February 4th. Six teams return to the semi-professional Western Indoor Soccer League. The Vancouver Victory will sit out this season after posting a 1-9 record in their first and only season in the league.